Wild Angelica grows in Ninewells wood and there is a lot of it in surrounding fields and hedgerows. It likes it on the wet side and will tolerate some shade. There is a wide forestry path running through the centre of Ninewells wood and along the sides it is quite wet, often there is a puddle which is semi permanent. This is where a lot of the Wild Angelica grows. Also along this path there is Hemp Agrimony, various thistles and Knapweed. This attracts lots of butterflies. 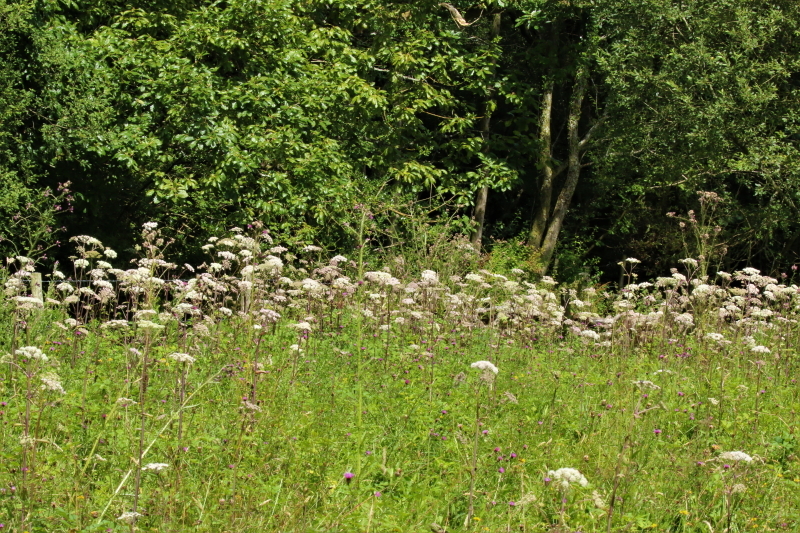 There is a wet meadow, that borders Cleddon bog and this has lots of Wild Angelica in it. This plant is in the carrot family, it is what is known as an umbellifer. Others which are in this family and which you will be familiar with are Cow Parsley and Hog weed. The characteristics of this plant are that it grows quite tall 2M to 2.5M is normal, also the flowers are often pink. 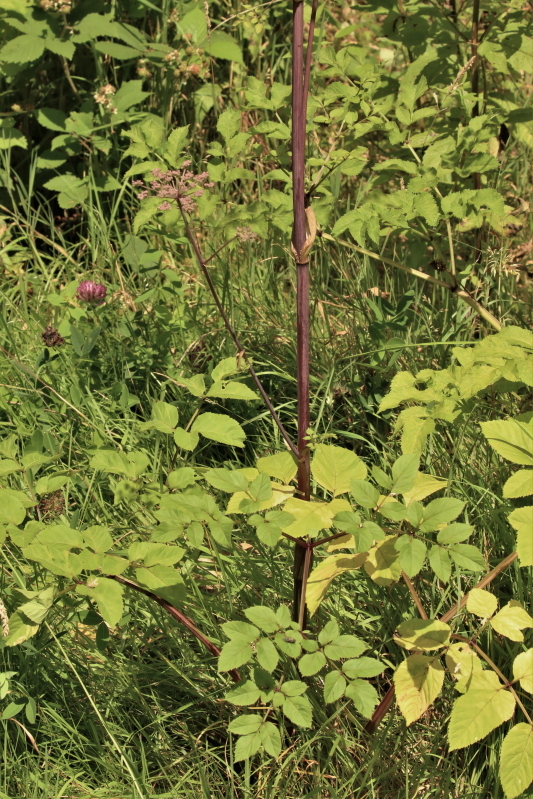 The stalk often shows quite a pink or purple colour. The only umbellifer which also shows this is the deadly Hemlock but this has a more blotchy purple colouration. 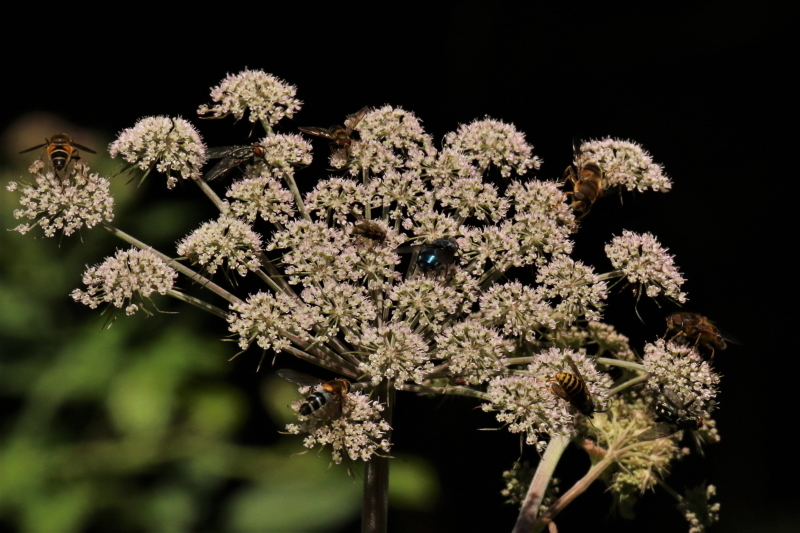 Wild Angelica flowers later in the year than many other umbellifers, it flowers from July through to September. What is quite odd about this plant is that the flowers attract lots of flies, hover flies and wasps, but rarely do butterflies visit. 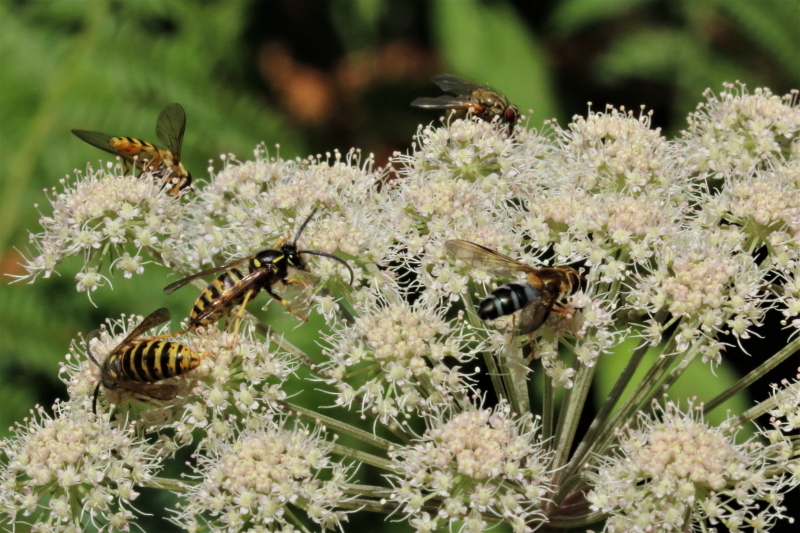 Is this because the wasps are putting them off or is it because they are not attracted to this plant. Angelica was used in the past as a vegetable, however to me the leaves have a rather nasty smell, similar to parsley but more acrid. Maybe the young leaves when cooked taste OK. I would be cautious though as it could be mistaken for Hemlock although this has a really disgusting smell. 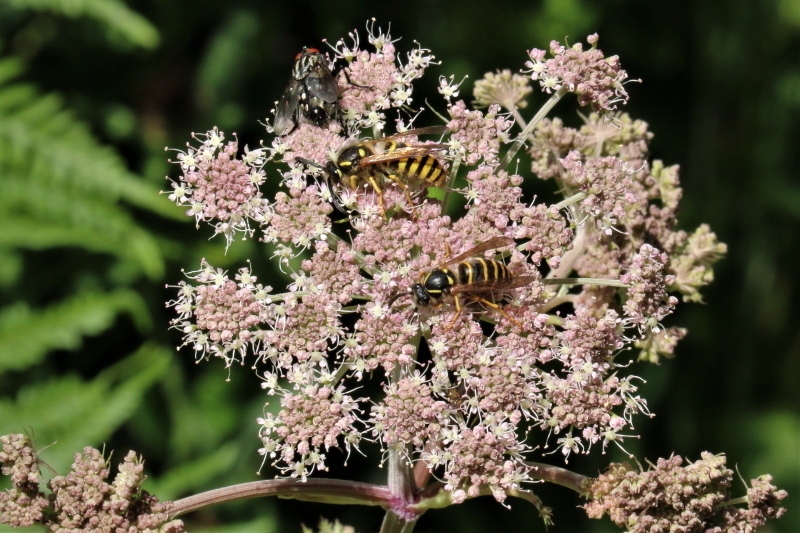 There is another form of Angelica called Garden Angelica (Angelic archangelica) which you can buy in garden centres and this is the one which people use the stems of to make a sweetmeat.